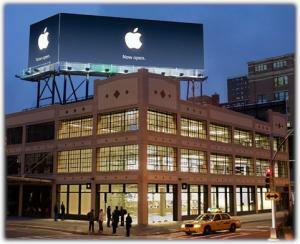 Apple's West 14th Street Store in New York will have its grand opening tonight at 6 pm EST. "We are thrilled to open our third and largest store in Manhattan on West 14th Street," said Ron Johnson, Apple's senior vice president of Retail. "We think New Yorkers will love this stunning new location and the incredibly talented team we've assembled to make the Apple Store West 14th Street a place where people can shop, learn and truly be inspired." The store is Apples first three-story store with two floors dedicated to products and a third dedicated to services, including a 46-foot Genius Bar and specially designed areas for workshops and personal training. ifoAppleStore is on location, and reports on rumors that Apple will be giving out free laptops to the first 10 people in line (there were 62 in line as of their post). ...visitors will be given a mystery gift, and upon opening it they will learn if theyre a winner. Prizes are entirely random over the entire evening. With the West 14th Street store, there are now 3 New York City stores, including the glass-cube 5th Avenue store and the original SoHo store. Photos of the new Apple Store.